It’s the end of the year and like everyone else I’m reading the “best of” lists being posted all around the interwebs. 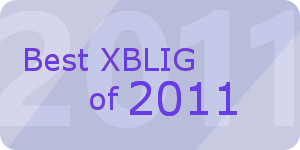 Here’s a collection I’ve gathered of all the “best of” lists for XBLIGs. If you have your own, let me know and I’ll get you added to my collection. There’s quite a few gems I missed that I’m seeing on those lists so I’m looking forward to doing some gaming as I ring in the New Year!